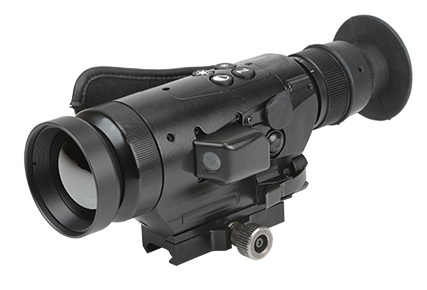 The Sii WS 60 thermal rifle scope provides enhanced night vision capabilities for a variety of applications. It delivers high-resolution night time images to carbines and rifles, enabling human size target detection up to 1,500 meters and vehicle detection up to 3,500 meters. The Sii WS 60 has a built-in laser pointer that allows for either day or nighttime maneuvering, and can be quickly adjusted and boresighted to the type of weapon being used making it ideal for all military operations. The Sii WS 60 is designed to increase accuracy and effectiveness in the field. This thermal scope provides the ability to detect threats in total darkness, bad weather, or when the target is camouflaged.